Back around Thanksgiving of last year, Leonard Nimoy & his son, Adam, started talking about how the 50th anniversary of Star Trek: The Original Series would soon be here. They also talked about how there had never been a documentary of Star trek based around the character of Mr. Spock…so they did something about it. Father and son conceived the idea for the film, and Zachary Quinto agreed to narrate it. As talks and negotiations progressed, and as all Trek fans sadly know, on February 27th, 2015 Leonard Nimoy passed away due to end stage COPD. 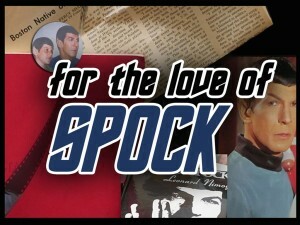 With the show of fan support for Leonard & his family after his passing, Adam has made the documentary not just about Spock, but also about his father. Adam has continued to work on the project since his fathers passing and is now to the point where he requires funding to do the bulk of the work on the film. Adam is asking for help from us all to complete his father idea of the documentary. So, to that end, he has start a Kickstarter campaign to fund the project. You will have until Wed, Jul 1 2015 7:00 PM EST to pledge, and support this great tribute the late Leonard Nimoy.